The Hyundai Grandeur puts an end to 8 straight wins by the Hyundai Santa Fe. This article has been update with the Top 85 foreign models. Stable sales in South Korea in November: down just 0.2% to 162.249 units leading to a year-to-date volume up 1.4% to 1.652.470. Local carmakers drop 0.3% to 139.862 in November and 0.2% to 1.411.915 YTD while foreigners gain 0.5% this month to 22.387 but a gigantic 12.6% YTD to 240.555. Brand leader Hyundai (+2.1%) beats the market to stand at 36.2% share, almost identical to the 36.4% it commands YTD, followed by Kia (-0.7%) while at #3 Ssangyong (+17.8%) signs the largest gain in the Top 8. 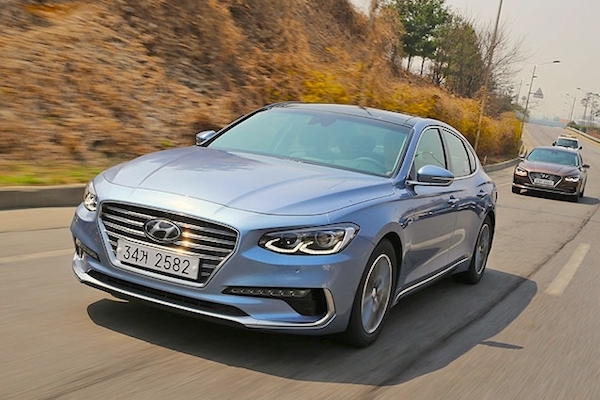 GM Korea (-19.9%) and Genesis (-15.4%) are in great difficulty among locals while Renault Samsung (+1.3%) is on the mend. Mercedes (+14.5%) annihilate the competition among foreign brands, selling almost 3 times as much as BMW (-63.7%) in total meltdown. Volkswagen climbs back inside the Top 10 at #9 followed by Lexus (+74.8%), Toyota (+43.3%) and Honda (+12.5%) all sparkling. Audi (+1815.2%) and Porsche (+125.9%) get back to life. Over in the models ranking, the Hyundai Grandeur (+0.1%) returns to pole position, ending 8 consecutive months of reign by the Hyundai Santa Fe (+99%) and thus consolidating its YTD leadership at 102.682 units (-17%) vs. 98.559 (+107%) for the Santa Fe. The Hyundai Porter (-8%) is down one spot to #3 ahead of the Kia Carnival (+16%), Hyundai Avante (-13%) and Kia Sorento (-25%). Bolstered by its new EV variant, the Hyundai Kona (+29%) remains at a record 7th place for the 2nd straight month. Other great performers include the Ssangyong Korando Sports (+104%), Kia K3 (+38%), K5 (+31%), Samsung QM6 aka Renault Koleos (+30%) and Kia K7 (+27%). Over in the foreign models ranking, the Mercedes E-Class remains firmly on top, selling more than double any other nameplate starting with the Lexus ES while the Mercedes CLS climbs up 62 spots on October to land on the third step of the podium ahead of the Mercedes GLC (+6), Toyota Camry (-1) and Honda Accord (-1) just as the VW Tiguan reappears at #8. Full November 2018 Top 30 All-brands, Top 60 All local models and Top 85 foreign models below. South Korea July 2014: Now with All-models and All-brands!